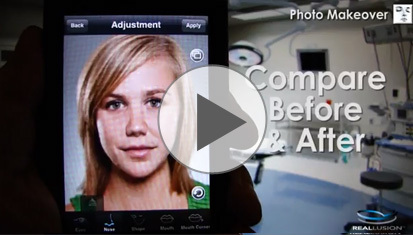 Snap a shot and then edit it with cosmetic magic to change facial features and adjust facial expressions with just a few swipes. 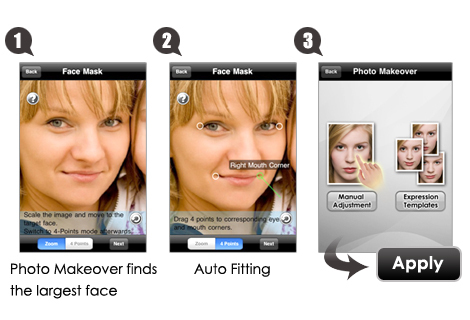 Photo Makeover is perfect for touching-up group photos, glamorizing portraits or for runway models, on the run. *Requirements: Requires iOS 3.0or later. Compatible with iPhone, iPad, and iPod touch. 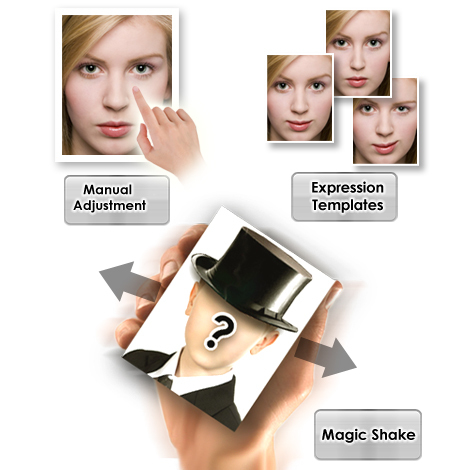 By locating four facial anchor points automatically or manually, the application will determine facial features and muscles for further facial feature adjustment. 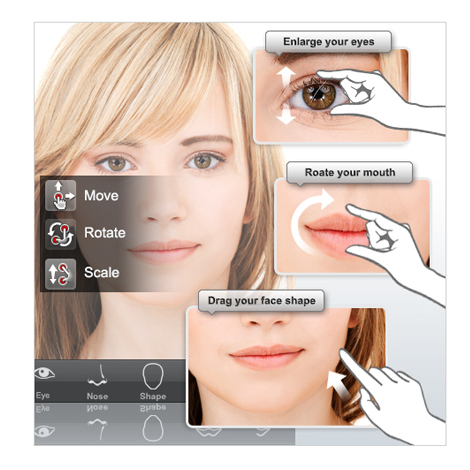 5 selectable facial regions each with move, rotate and size controls; and the facial outline width and height control provide the ability to make thousands of subtle changes. 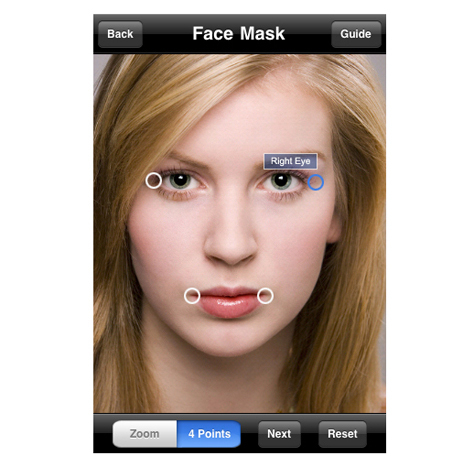 With the iPhone panel, you may enjoy manipulating facial features by dragging, pinching, spreading, and rotating on the screen with merely two fingers. Subtle change makes the difference. 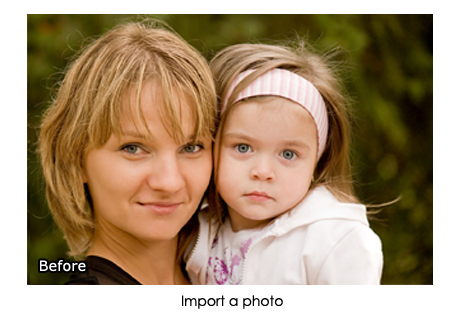 Photo Makeover includes a library of pre-made facial templates created by analyzing thousands of faces. 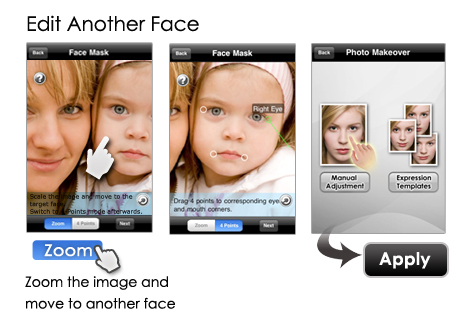 It gives you a quick view of the possibilities of a better or even the funniest look of your face. Select a preset expression and adjustment is then made with “Expression Strength” slider bar. 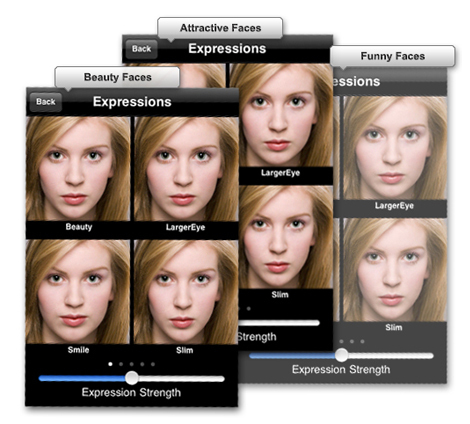 Beauty faces: Younger, Proportional, Slimmer. Attractive faces: Confident, Sexier, Kinder, Smile. Naughty faces: Make Face, Kiss, Angry, Sleepy. 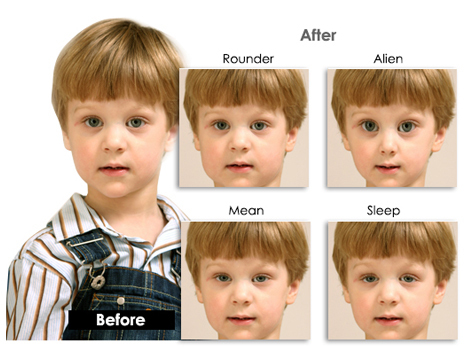 Crazy faces: Alien, Sleepy, Rounder, Mean. Animal faces: Koala, Fox, Bull, Monkey. 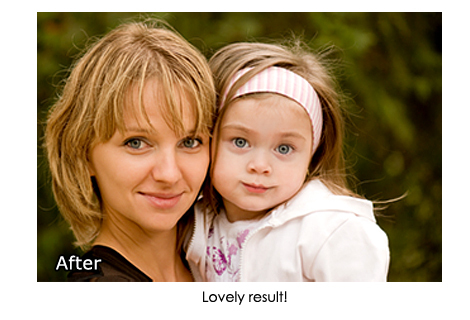 Photo Makeover's powerful image color correction uses automatic color balancing. Create vibrant colorful photos from imperfectly lit images such as over/under exposed, taken with a low quality camera or washed-out due to backlighting. Shake left and right for a fresh face. Shake up and down for a funny face. Shake twice for stronger effect. *Apple, the Apple logo, iPhone and iPad are trademarks of Apple Inc., registered in the U.S. and other countries. App Store is a service mark of Apple Inc. Copyright © 2015 ReallusionInc. All rights reserved.